So when in the midst of play the question was asked “do you want to stay for dinner Meg?”. It was an easy answer. “Let me check with my mom”. Sadly, it wasn’t because I was a good kid. Keep your delusions of me if you want, but that nice, etiquette conscious child you are picturing was really just hedging her bets. What I would actually do was run home in bare feet across the gravel drive, check what my mom was cooking and then, depending on her answer, go back next door and say “my mom says I can’t” or “sure, my mom says it’s okay”. Truly it was a win-win situation. As an aside, recently I discovered my cat has been doing the same thing. Apparently all cats (not just the cats that live in a specific house) can get in a cat door and I owe my neighbour some cat food… kids these days. Seriously. Who messes up muffins? So it is a pretty safe bet to say that if you are a guest in my house you will never be served pie. 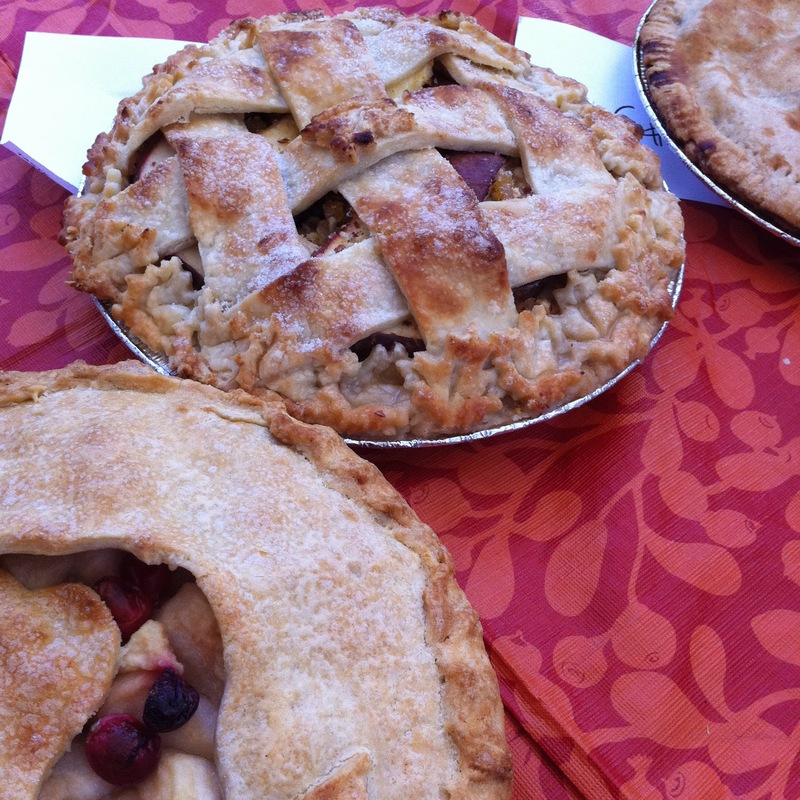 I may however serve you something pie shaped. 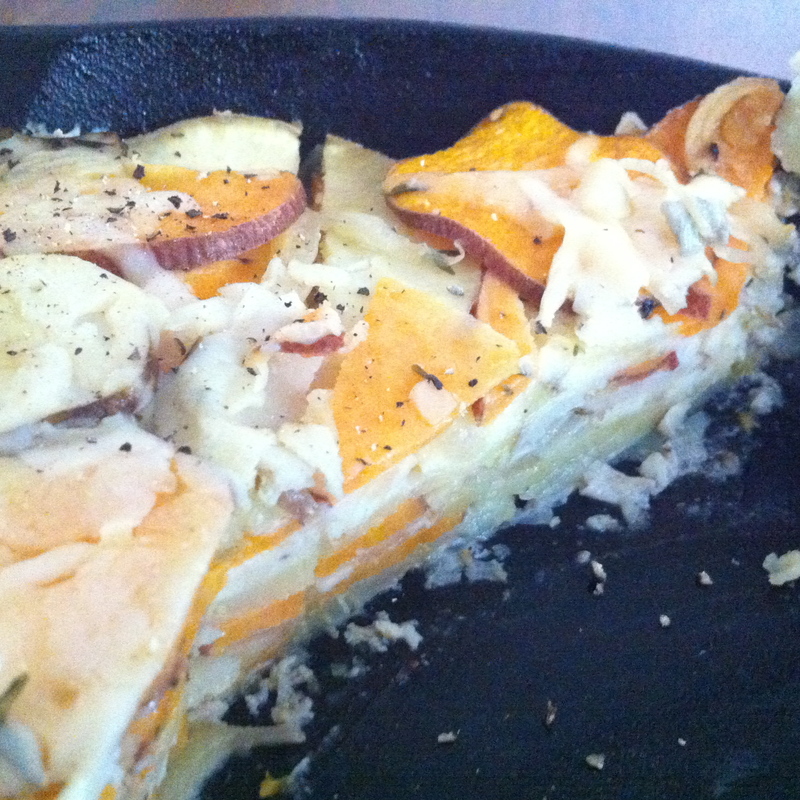 Lately I’ve been experimenting with baked savoury dishes. Now I’m a bit confused. I’m not sure what I’m supposed to call the following recipe. Pie? Tart? Cake? Gratin? The answer to that question probably depends on the type of pan you bake it in? I’ve decided to go with a gratin because it sounds fancy but it could just as easily be called a root vegetable pie. You can bake it in a cast iron pan (my favourite choice), one of those fancy shallow dishes with scalloped edges, a pie plate, a casserole dish or even a cake pan. However you bake it, or whenever you make it (the morning before a dinner is ideal) it might just be good enough to distract your guests from the fact that there was no pie. 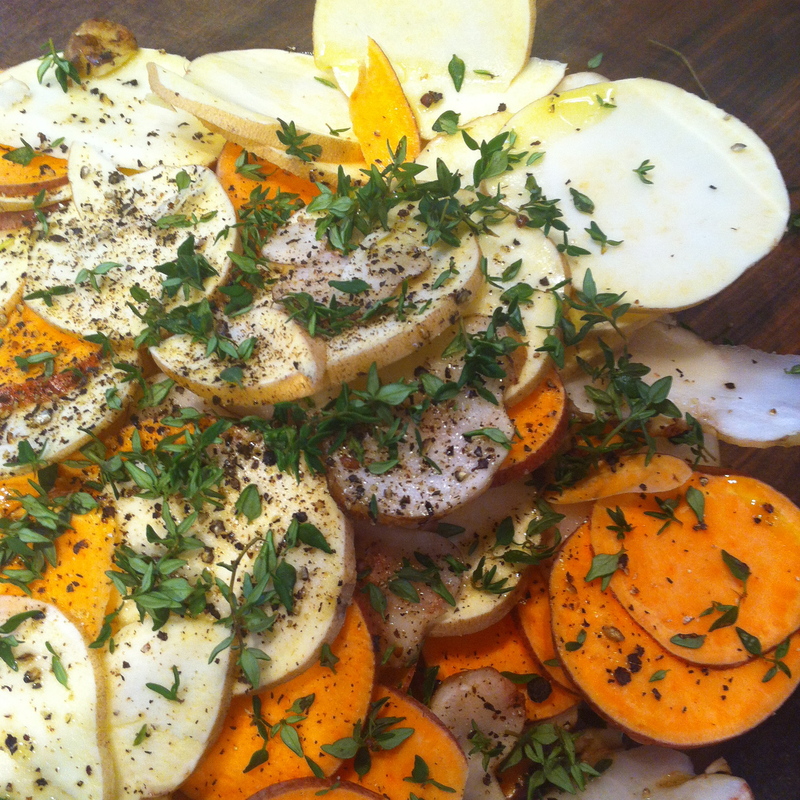 As onions cook thinly slice all root vegetables and place in a large bowl. Add the glug of oil, herbs, garlic (if using), salt and pepper. Set aside. Grate the cheese and mix together if using more than one type. Generously butter all sides of your baking dish. In the buttered dish begin layering vegetables, then onions, then cheese until dish is full. If using cream pour gently over until you see it just starting to sneak up the sides. Cream will make the gratin moister, but sometimes leaves a bit of liquid behind which is kind of gross. It can easily be drained off. I’ve tried it both ways and they both work. 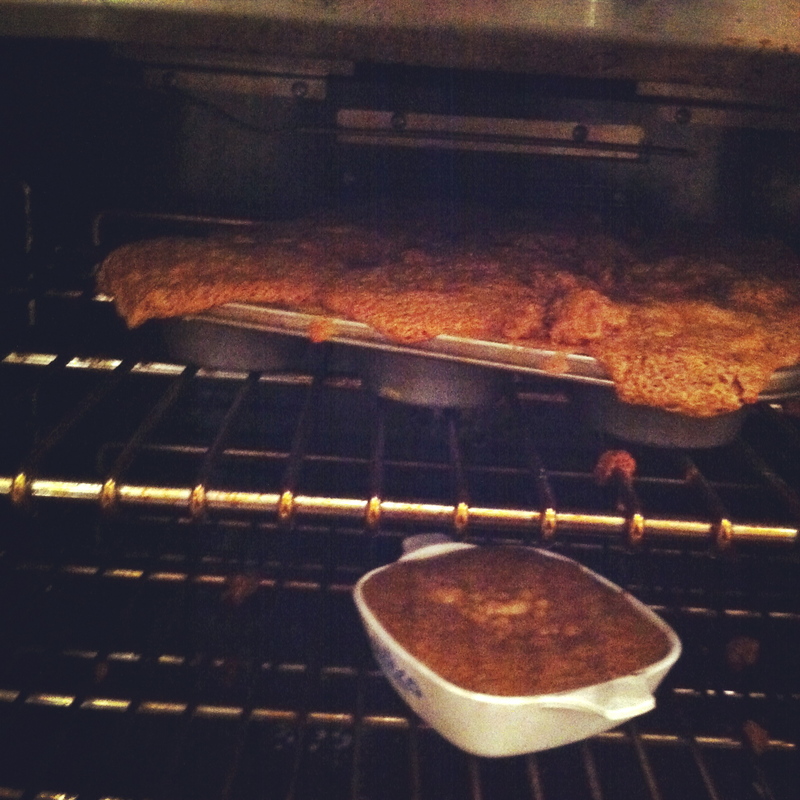 When the gratin is cooked remove from oven and let rest for at least 30 minutes to set. See? Wasn’t that easier than a pie? And the best part is is tastes great the next day, warm or cold, for breakfast or lunch so you can enjoy spending time with your guests. 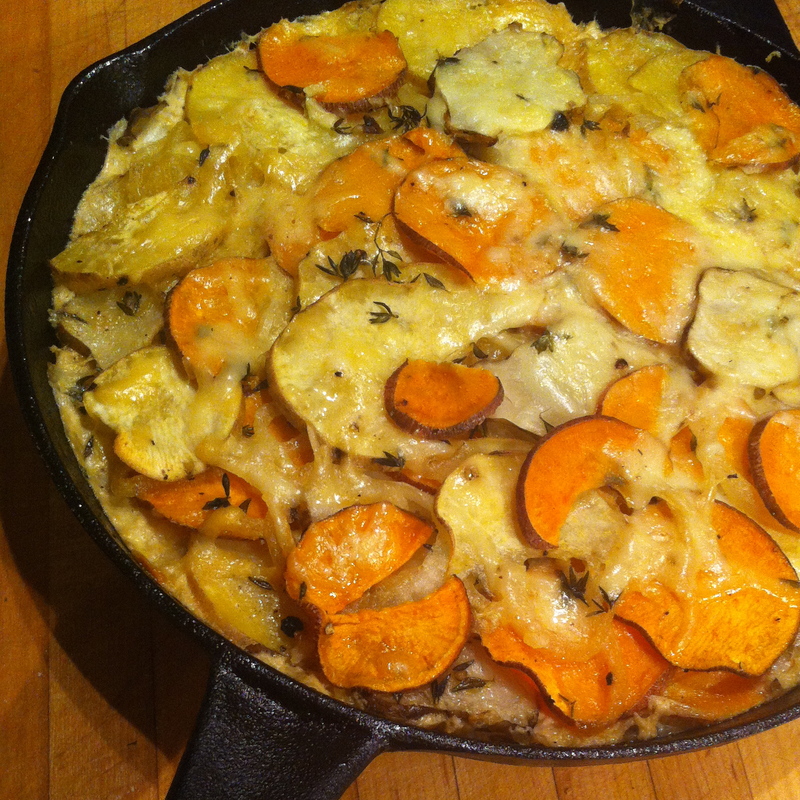 This entry was posted in Cooking, Food, Friends, Lunch, Recipe, Side Dish, Vegetables and tagged cast iron pans, cheese, gruyere, jerusalem artichoke, onion, sage, spices, sunchokes, sweet potato, yam by mostlynoodles. Bookmark the permalink. That’s it. This week I am making the gratin. I’m salivating just looking at the picture. Always remember to err on the side of cheese! The gratin looks wonderful and I’m going to try it! I made the gratin and made a version with broth and no cheese for my lactose intolerant niece. Both were great. I served the cheese one as the main course as my family doesn’t eat much meat. It was even better the next day for lunch. thanks.